The public is to be consulted on the future of the country’s railways on foot of a new review which warns of line closures if very significant additional State investment is not provided. The Minister for Transport Shane Ross said on Monday that he will be bringing details of the new rail review to Cabinet next week. The National Transport Authority (NTA) signalled on Monday that there would be no rail line closures ahead of a full public consultation. Separately one of the main trade unions representing staff at Iarnród Éireann warned line closures would have industrial relations implications at the State-owned rail operator. The Irish Times reported on Monday that a number of rail lines may be forced to close as a result of a large funding deficit at Iarnród Éireann which is threatening the company with insolvency. The draft report of the review says the rail network requires investment of more than €600 million over the next five years. The report says in the absence of any additional Government funding, large chunks of the rail network will have to close to eliminate the funding gap. This would leave only the Dart, Dublin and Cork commuter routes and inter-city services from Dublin to Cork, Belfast and Limerick in operation. The review was compiled by the NTA and Iarnród Éireann to examine possible solutions for the financial sustainability of the State-owned rail operator. 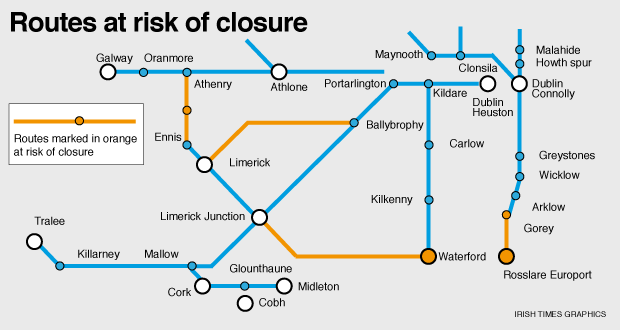 It says even with some additional Government funding, the routes from Limerick- Ballybrophy and Limerick Junction- Waterford could close. It also suggests that part of the Limerick-Galway route from Ennis to Athenry, which only came back into service in 2010 at a cost of €100 million, and the Wexford line south of Gorey could be shut, leaving Wexford town and Rosslare without a rail service. The draft review says that while numbers using the railways have started to rise again after the economic crash, Iarnród Éireann will still lose about €11 million this year. It says the company incurred accumulated losses of €150 million between 2007and 2015 despite delivering €76 million in savings in the same period, mainly due to reduced State funding and falling numbers. “The company cannot incur further losses as it will become insolvent,” it says. The review says the balance sheet cannot sustain any unexpected financial shocks. It says that to address solvency issues and underfunding in previous years, the company would need an additional €144.6 million in 2017, €158.4 million in 2018 and €154.8 million in 2019. This additional funding requirement would fall to €93.4 million in 2020 and €90.6 million in 2021. The Department of Transport confirmed Mr Ross had recently received a copy of the rail review conducted by the NTA and Iarnród Éireann, which, it said, examined the funding parameters required to support the country’s rail network now and into the future. The Department of Transport said that in the meantime, the Government in the recent budget provided for more than €50 million to Iarnród Éireann next year aimed at increasing investment in maintenance and renewal of the network and the rolling stock, and also to provide more funding for safety projects. In a statement the NTA said: “The report will be published shortly, at which point, findings, options and conclusions, in their entirety will become clear. “No action or decision will be taken by any party in advance of a full process of public consultation, which will get underway when the document is published. The National Bus and Rail Union (NBRU) said there was “a danger of revisiting the dark days” of the late 1990s when a derailment at Knockrokery led to the commissioning of a report by the then minister Mary O’Rourke into rail safety. The report found among other things that Iarnród Éireann was drastically underfunded. It said while talk of closing rail lines would obviously have industrial relation ramifications for trade unions, “it most certainly would create political fallout given the commitments sought by Minister for Transport Shane Ross’s Independent Alliance in the programme for Government in relation to a possible extension of the Western Rail Corridor”. NBRU general secretary Dermot O’Leary said: “While the NBRU has consistently highlighted the lack of Government support, it is noteworthy here that this particular review has been undertaken by the NTA, who along with the department have direct responsibility in ensuring that all modes of public transport, inclusive of rail are adequately funded. Iarnród Éireann did not comment. However it pointed to comments made by its chief executive David Franks at a recent Oireachtas committee hearing in which he said that both areas of the company’s business , train operations and infrastructure management, continued to operate through an era of unprecedented challenge. “While business growth has made a much welcome return, the cumulative and continuing effect of operating losses and underfunding challenges our ability to operate sustainably and to maintain the levels of safety and service performance,” he said. “Financially, notwithstanding reducing our cost base by over €73 million per annum during the economic crisis, we will again record a loss in 2016 albeit better than forecast as a result of passenger growth.